This is a city located in the central area of Goa just 29 kms from Panaji capital of Goa. 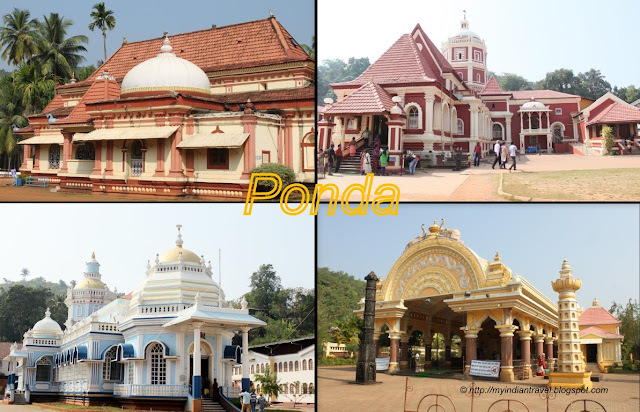 It is Goa's fastest-growing city and is also known by the name Fonda. In the 16th century, when Portuguese invaded Goa they started persecuting Hindus. As a result they stared to move into Ponda to escape persecution by Jesuits and the Portuguese. Later Chhatrapati Shivaji Maharaj seized Ponda from the Bijapur Sultanate. Under Shivaji, Saundekar Raja was the vassal of Ponda. But again Portuguese took control of the place. Hindus occupied the forests of Ponda and built makeshift temples for the idols they were able to save from the broken temples. These makeshift temples were slowly renovated as the Hindus gained prosperity. Hello, lovely images of the city! I like the building in first photo. Happy Monday, enjoy your new week! Boa tarde, lindas fotos de difícil captação, as mesmas estão perfeitas. It looks like a beautiful city. They are beautiful. I never get tired of seeing the amazing architecture you share. I have visited some them. Gruesome past indeed! How gorgeous - and what lovely brickwork in that first photo. Beautiful red bricks of the temples Rajesh. All wonderful photos with such history behind them. Fascinating architecture and difficult times! It is a tragic time in the past but the buildings are lovely. The first photo looks like a fort. Is that the case? India is one of the most interesting countries in the world. In spite of the hard times it faced all the difficulties and built up the temples again with the same patience and love as before. It's amazing! Thank you for sharing your history and culture.It helps us to understand your way of life. Shooting Parrots: It is a artificial fort. oppression. one of those constants. The temples look so tranquil despite their turbulent history. Good to know about the place and the history, nice presentation with beautiful pics. It appears to be a beautiful place..nice clicks! Nice story with pretty picture.